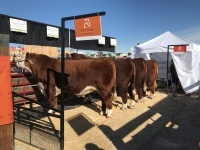 Broken Rock Farms specializes in breeding and caring for Registered Polled Hereford Cattle. If you have questions or would like to be added to one of our waiting lists, contact us anytime by email or phone. Congratulations to Pitt Farms for placing third in their class at the National Western Stock Show in Denver! Like what you see? These bulls are for sale! Contact us for more information or head to Pitt Farms website for more information. Our farm is proud to be partnered with Pitt Farms Herefords in Ames, IA. 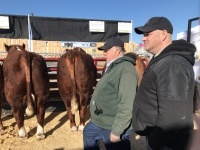 This longtime hereford breeder strives to improve the breed with a genetics program that includes ET, AI and natural breeding practices. Click on their logo to navigate to their site and see what they have to offer.